Why haven't I heard of this until now? This January, the Phantasten Museum opened at the Palais Palffy in Vienna. It specializes in visionary and fantastic art - how marvelous. So happy to see this type of art gaining more recognition and institutional support. And, gives me a good reason to go back to Austria someday. 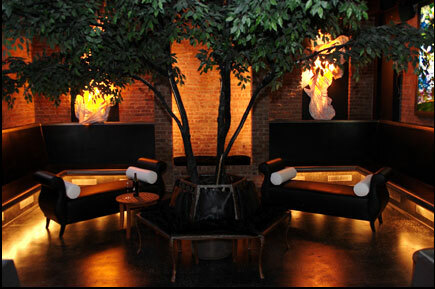 A few months back, I posted about the stunningly beautiful new lounge, Deity, being built on Atlantic Avenue in Brooklyn. I am thrilled to inform you that this Friday evening, Deity will be opening its doors to the public for the first time with a soft launch, from 9pm-4am. Local artists, friends, and neighbors are welcome. They will be open again on Saturday, and then every Friday and Saturday night in December. The official opening is on New Years Eve, and it would be a perfect place to ring in 2008 with decadence and mystique. Do stop by for a visit! Fabulous news. One of my very favorite shops in NYC is reopening! Zakka is a Japanese-run space with a mind-boggling selection of art books, international street mags, T-shirts, and designer toys. I was so sad when their store in Manhattan mysteriously closed. Can't wait to check out their new digs in DUMBO. And if you like free drinks (and who doesn't), you can go to their opening party tomorrow at 7pm: 155 Plymouth Street, Brooklyn, NY. 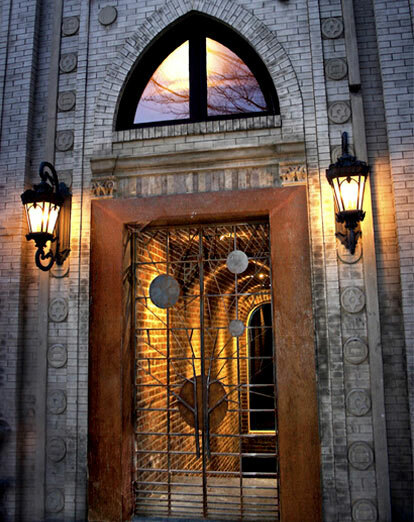 The above is a picture of the entrance to Deity, a new lounge opening late this year on Atlantic Avenue in Brooklyn. 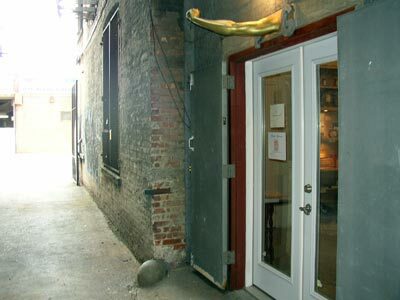 The doorway alone is so intriguing that after I passed by it for the first time, I immediately had to send an email and inquire about the space. As my luck would have it, this led to a private tour given by the owners, a warm and passionate couple named Caio and Kristine. The lounge is a gorgeous bi-level space that pays homage to neo-spiritualism through various pagan symbols and religious iconography. It is integrated into a synagogue's original facade, while still feeling absolutely contemporary. Hand-crafted details such as stained-glass panels, illuminated goddess scupltures, and intricate ironwork have been commissioned from local artists, and each element lends to the overall air of mystery and beauty. This enormous undertaking is nothing short of a labor of love. It is four years in the making, and has consisted of massive architectural overhauling and limitless investments of time and energy. But I am certain the hard work will pay off. This is a most special place, where one will be able to have an utterly transcendant night consorting with creative souls and imbibing candle-lit elixirs. Can't wait for the opening. This past weekend, I took myself on a date to visit Proteus Gowanus, a gallery that's just a short jaunt from my home in Brooklyn. It is a gorgeous space that is tucked away in an old warehouse, and it has rotating exhibitions that contain mixed media variations on a selected theme. Currently, the theme is "Library," and each piece explores the ideas of cataloguing, titles, or reading. A second room houses the "Museum of Matches," another wonderful show that tells the story of Cold War Russia, albeit non-linearly, through ephemera, excerpts, and assemblages. Finally, it must be mentioned that the gallery has a tightly edited shop which sells such delights as limited run books, beeswax bottles, and slippers made from a questionable material. I will certainly be back. Talking about KunstHausWien made me think about some other wonderful museums and spaces I've been fortunate enough to visit over the years. One such place is the Frisia Museum, in the Netherlands. To get there, one has to take a series of buses from Amsterdam to Spanbroek, which makes for a rather lenghty excursion. But it is well worth the trip! The Frisia Museum is an art museum which specializes in Magical Realism. While this is a loosely interpreted theme, the works therein are just marvelous, many by artists I had never heard of before.